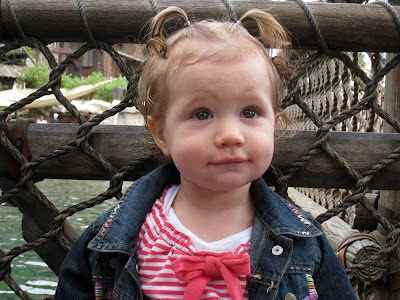 On our final day at Disneyland, we started out with our favorite ride: Pirates of the Carribean. Krista's favorite part was the addition of Jack Sparrow. Ava's favorite part was clapping her hands to the song "A Pirate's Life for Me". Next we were off to Tarzan's Treehouse for some swinging fun. 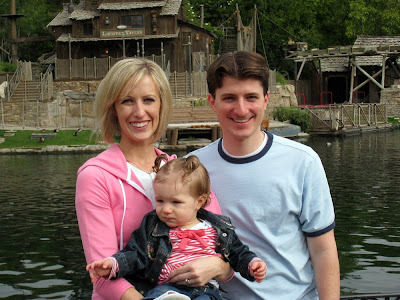 After our jungle escapade, we stopped to have some family pictures taken in front of the water with the Pirate's Lair on Tom Sawyer Island looming in the background. Ava was more interested in her Aunt Maddie's collector pins than in having her picture taken. She has since started her own pin collection (as the Disney marketing execs maliciously laugh). 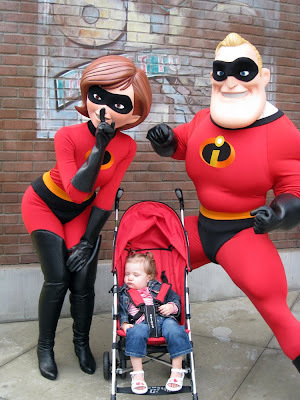 We then set out to get some pictures with several of the Disney characters. 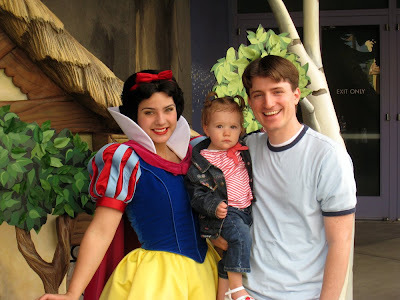 Here's Larry and Ava with Snow White. By the time we finally made it to the front of the line for a picture with Mr. and Mrs. Incredible, Ava was out. 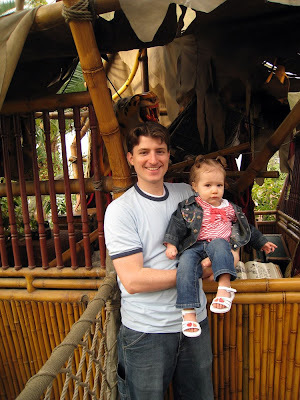 She soon awoke, however, so while Krista and some of her family went to see the Aladdin Musical, Larry and Ava decided to go on an expedition to the Pirate's Lair. 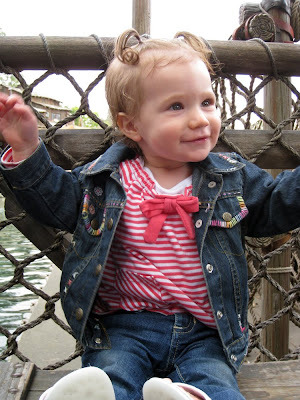 Ava loved riding over to Tom Sawyer Island on the river rafts. Her eyes grew wide as we neared our final destination. 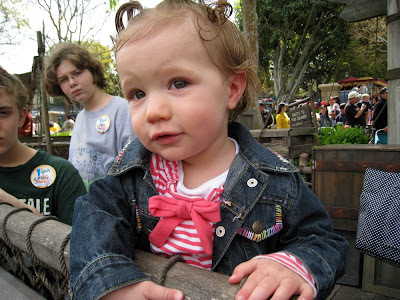 Several rides and shows later, our final day at Disneyland had drawn to a close. 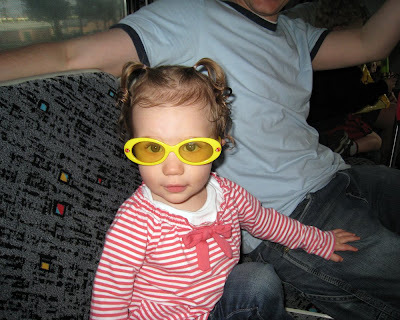 With the sun having already set, Ava decided she was finally ready to wear her sunglasses on the shuttle bus ride back to the hotel (better late than never). 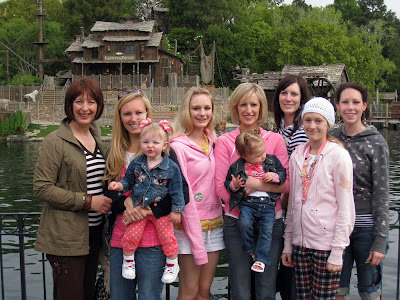 What a fun trip...it looks like Ava...and Mom & Dad really enjoyed it!! She is so cute in her sunglasses...and you're right...better late then never!! She is so cute...I love her big eyes!! It sure was a great trip to Disneyland. The little girls were so much fun to have together. The pictures are darling. And Ava is so cute. We need to get them together again.